News now from Sean Doyle at Northrop & Johnson that he's listed the 27.4m expedition motor yacht Hope for sale. Built by Palmer Johnson in 1992 and formerly named Ma Mu IV, she can be run by just two crew and accommodates six guests in three staterooms. Twin 380hp Caterpillar engines give Hope a cruising speed of 10 knots. 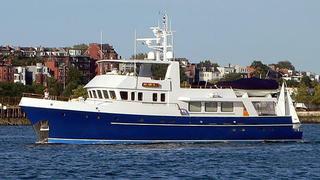 Hope has just completed a $1 million refit and is asking $3,695,000.